60 Christadelphian brothers in Britain have read the whole of the Bible using the King James version. Each chapter is read by a different brother. 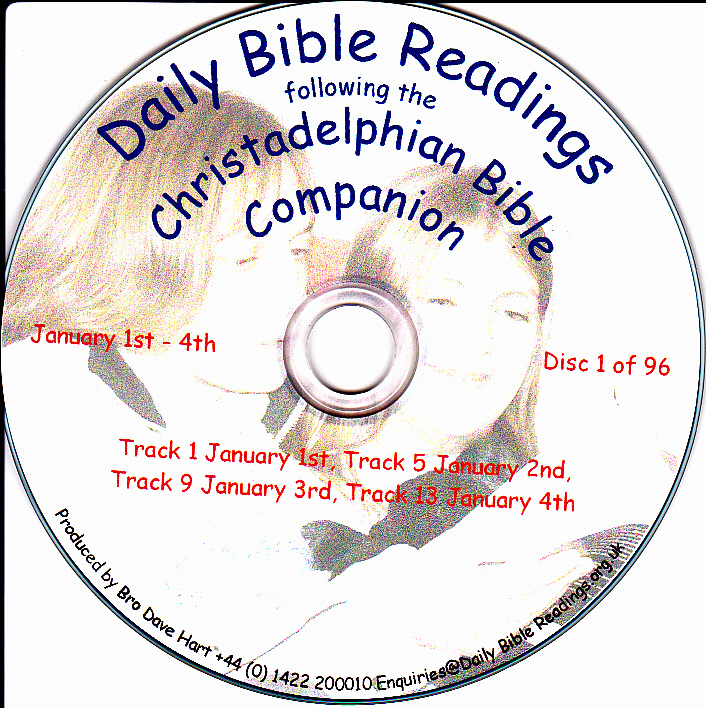 Each of the 96 CDs contain 3/4 days readings - following the Christadelphian Bible companion. If we are out of stock the CD's can be obtained from Doug Bailey <hnts01@bigpond.com>. Another version of Daily Bible Readings on DVD is suitable for down loading to a PC and playing from an easy to use desk top icon. The CDs are supplied in a very nice container similar to a Bible cover. The cost includes a donation to the Christadelphian Bible Mission project of $24.00 so please don't copy the CDs or loan them to a friend to place on media such as I Tunes.